Ok so this is pretty pitiful! I own ONE cloche to my name. Our dear friend Marty from a Stroll thru life is having a cloche party and I so wanted to join in. I decided what better place to get inspiration than the Pinterest! I thought with Christmas right around the corner, why not look for some Christmas inspiration. Look at that little snowman ornament, he is so cute! Well I think I found just about all the Christmas cloches I could. winner will be announced tomorrow using random.org. Some good copy cats out there! Magazine copy cat challenge, ready, set, let's GO! We certainly get inspiration from magazines, and now currently all the blogs we follow. I found quite a few Christmas inspirations, however, I thought way too early for that. 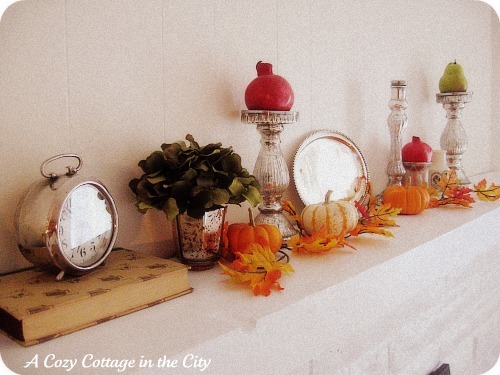 from Country Living, I just adored. 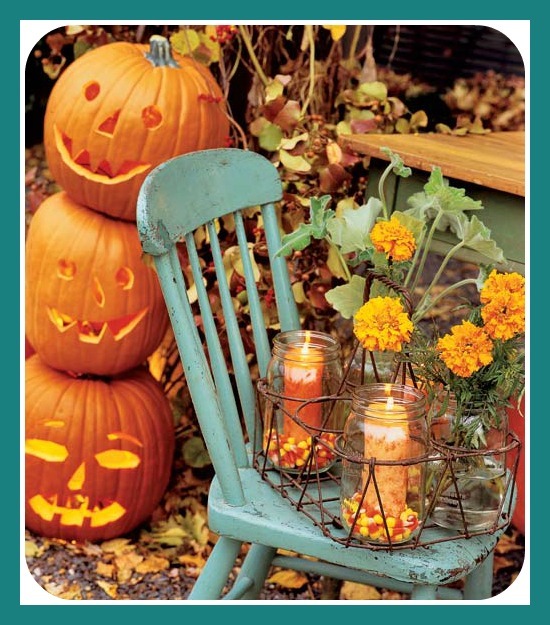 I thought, I can do this one, I have the chair, pumpkins, candles, candy corn and a cute little caddy! First of all it was a very cold and windy day to be lighting candles...surprising, they stayed lit. My cute little chicken wire caddy filled with candy corns and flowers, and added some napkin rings for a splash more of color. I wish the leaves were all turned, but not quite yet. And there you have my simple magazine copy cat challenge. Thanks so much for joining in on the fun. This will be a MONTHLY party, so get your thinking caps on for next time, if you missed this time around! Yesterday was a bitter sweet day for our families of Fort Mill High School band. They had long awaited for THIS day. made history at the bands of America in Akron Ohio. Yesterday, Fort Mill placed second in the State, out of 17 other bands in South Carolina. The band that came in first, are their friendly rivals. Nation Ford High School, which is also in Fort Mill, South Carolina. Obviously, a very large talent pool of kids here in one place. Alex and Jordan still smiling, and very proud of their accomplishments. Of course, they have all worked so hard, and really wanted to be Number one, it is certainly a bitter sweet lesson to be learned in life. They are clear winners in our eyes. I wanted to share this video from the Band of America's show in Akron, Ohio. This is where they made history that will last a life time here. I think you will be blown away at the fact these kids are just in High School. The show was Vertigo, based on the Alfred Hitchcock movie. So yes, at times you see confusion, and spinning, that is part of the show. See you later for the Magazine copy cat challenge. You may click on the right side of arrows to expand your screen. Yep, I have been copied out here once again! When you ladies get your creative juices flowing, and you tell me that I inspired you, I can't tell you how much that means! I go skipping around the house all day long! Really, it means a lot to me! I do have fun, and if nothing else that does shine through! That is the best advise I can ever give..
Be yourself, stay true to yourself, and Have fun! She is pretty new to the blogging community. Maria Elena, really liked my kitchen pillow made out of drop cloths. She did an even better job than I! but you see my friend Jo, she is such a great friend, she wanted to really take it to the next level. of course Jo, shares more on her copy cat. BUT, OH my did I laugh my head off. Gail just made this cute little rooster lamp too. Have a great weekend ladies and gents. this handsome fella has his last and final performance for State band champs. yes, that is Alex's girlfriend, she is all made up and hair updooed for the show. Fort Mill High School band is undefeated this year, simply amazing. Best of luck to all of them, we will be there on the edge of our seats. No newbie party on Monday, in lieu of it, there will be my magazine copy cat challenge info found on my side bar. This was a simple stencil project, I thought I would share real fast! After all, stenciling is such an easy inexpensive way to transform, a room, a pillow, furniture, you name it, it can be stenciled! What a steal! But what am I going to do with another stinkin pillow? In the cart it goes...what will happen nobody including me even knows. 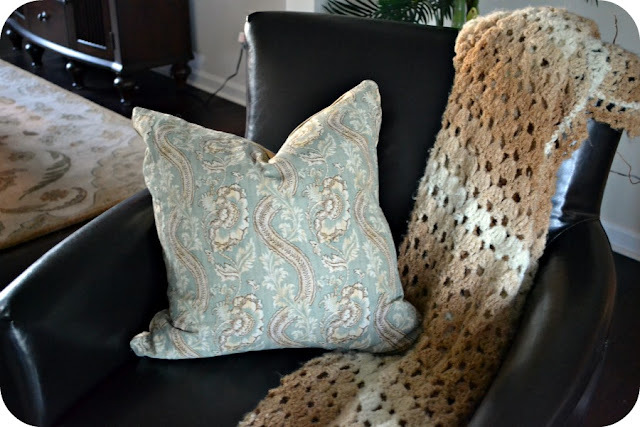 Geez, how easy is this to take a plain ole pillow and pizazz it up. Stenciling on fabric is a real cinch, I have mentioned that before, but I will tell you that again, just in case you are hesitant. How about a sneak peek at something else in the room, NEW! It was deal too good to pass up. I went back to the Homearama event and they were selling all the furnishings and accessories in the model homes. SCORE! Show you that sometime later on. Don't forget my Magazine COPY cat challenge party will be on Monday. I look forward to seeing you and your fun copy cats! Details on my side bar. Another fine week at the party. I am meeting so many new bloggers, and the old crew is moving on. Sad, but happy for them. Here are a few highlighted newbies that stood out to me. Jessie, has a lovely blog and a lovely touch indeed. Shannon will not disappoint. She is funny too, very energetic and a positive friendly gal! Zuni's table was a real inspiration. How about these awesome napkin pillows! Inspired by Pottery barn, and of course done on a dime! THERE will be NO Newbie party next Monday. In lieu of the party will be a magazine copy cat challenge and you may see the info on my sidebar. If I blabbed about you, feel free to grab a blab button, also on my sidebar. 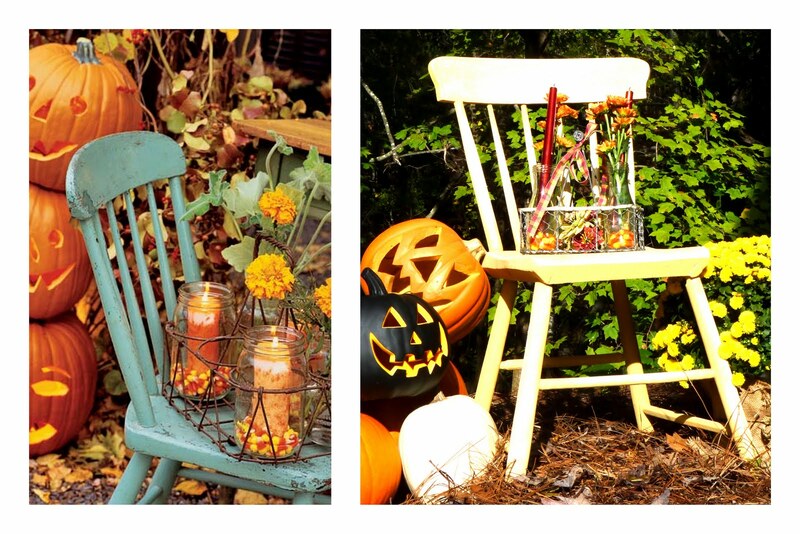 So I suppose I raised the bar a bit by putting out there the fact HGTV featured last years Halloween tablescape on their Halloween decorating. I certainly did not have to run out and buy anything new. I dug deep into my rubber maids and used what I had. My skeleton centerpiece is a must, I love him! Perhaps next time, they will mind their manners! go ahead, I dare you to eat just one! My new chalkboard placemats are getting put to good use. pretty scary stuff I tell ya! I will say Alex filled it out a lot more than Jack did, he was a real chub a lub! Almost 10 pounds at birth.. So all in all my table scape was a lot of fun. I felt a tiny bit of pressure I tell you. Thank you so much for all the lovely comments. I know a lot of you were excited to see this year's and I hope I did not disappoint. Did I tell you I am having a problem with mice this year? Darn things turn up and scare the heck out of me!